New Delhi : Indians were the sixth-biggest out-of-pocket health spenders in the low-middle income group of 50 nations in 2014, according to an IndiaSpend analysis of two recent studies by The Lancet, a British medical journal. The Lancet had conducted two studies — published on April 19 — across 184 nations on public and private spending on health. The first showed that while total health spending varies directly with economic development, there is substantial variation among countries. The second predicted that government spending in low-income countries will need to grow substantially, because private per capita health spending in these countries will not grow as fast as required. Among the 184 nations surveyed, Indians, along with Bangladeshis, stood sixth among the biggest out-of-pocket spenders. At 65.6 per cent, private expenditure on health by Indians stood 37.45 percentage points higher than the world median of 28.15 per cent. In the South Asia region comprising Bangladesh, Bhutan, India, Nepal and Pakistan, the out-of-pocket health expenditure of Indians and Bangladeshis was 10.2 percentage points more than the region’s median of 55.4 per cent, our our analysis showed. 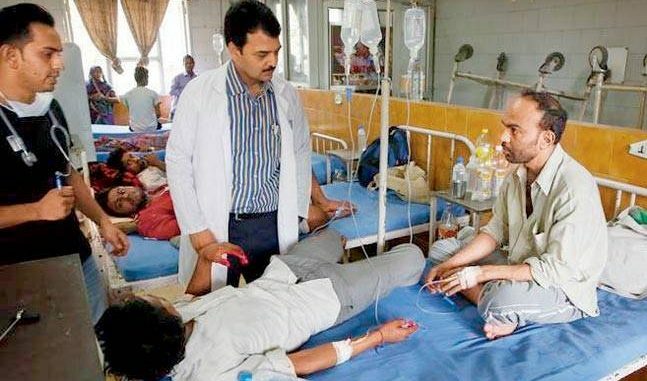 Indians also topped the BRICS group (Brazil, Russia, India, China and South Africa) in out-of-pocket health expenses, shelling out 31 percentage points more than the group median of 34.6 per cent. In terms of spending on public health, India ranked 147 among 184 countries, a notch below Pakistan, in 2014. At 31.3 per cent of their citizens’ total health spending in 2014, the government’s contribution was 23.7 percentage points short of the world median of 55 per cent, the IndiaSpend analysis showed. Among the 50 lower-middle-income countries, India’s government ranked 39 in 2014, spending 15.9 percentage points less than the group median of 47.2 per cent. Among the five South Asia region countries, the country’s government was the median country in the year, contributing 31.3 per cent to total per capita health spending. Government share of total health spending in India is a little less than in Pakistan (32.1 per cent) and less than half of that in Bhutan (70.7 per cent). Among BRICS nations, India spent the least on public health — 15.7 percentage points less than the group median of 47 per cent in the year. The Lancet research studied the relation between economic development and health spending in 184 countries between 1995 and 2014. The researchers concluded that though economic development and health spending do not necessarily go hand in hand globally, on average, the government’s share of total per capita health spending increases while of out-of-pocket spending decreases with economic development. In 2014, the Indian government spent about four percentage points more — and Indians spent about five percentage points less out of their pockets — on health as a share of total health spending than in 1995, World Health Organisation data show. In the 10 years to 2014, out-of-pocket health spending has pushed 50.6 million people back into poverty, an analysis of the 68th and 71st rounds of the National Sample Survey by Shailendra Kumar Hooda at the Institute for Studies in Industrial Development, New Delhi, shows. Compared with public provisioning of health facilities, insurance-based government initiatives have been largely unsuccessful in reducing out-of-pocket health spending as a share of total household spending, according to Hooda. Households in districts where central and state governments target insurance policies more heavily are more likely to fall below the poverty line than those where enrolment under pro-poor health insurance scheme is low, Hooda showed. The Indian government aims to increase health spending to 2.5 per cent of GDP, from 1.16 per cent in 2015, according to the new national health policy released in March. The WHO recommends spending five per cent of GDP. The good news is that Indians are likely to see a greater fall in out-of-pocket health spending by 2040 (11.3 percentage points) than an average global fall (1.4 percentage points), our analysis of The Lancet’s projections for 2040, based on its 1995-2014 data, found. The Lancet forecast used economic data for 184 countries during 1980-2015 (health spending data during 1995-2014) to estimate the relation between economic development and health spending patterns for the next 25 years from 2015. Yet, 54.3 per cent Indians are still projected to spend 29.4 percentage points more out of their pockets than the world median (24.9 per cent) and 19.1 percentage points more than the low-middle income group median (35.2 per cent) in 2040. The projected increase in government’s share in total health spending in 2040 is just short of the average increase for the South Asia super region (12.5 percentage points) at 12.4 percentage points, but higher than the average increase for the world (6.1 percentage points) and lower-middle-income group (9.7 percentage points). The Indian government’s share in total health spending in 2040 will still fall short of the world median (62.05 per cent) by 18.35 percentage points, the lower-middle-group median (52.6 per cent) by 8.9 percentage points and the BRICS group median by 10.1 percentage points. In the South Asian region, the Indian government’s contribution is projected to remain the median in 2040. Among the BRICS nations, the Indian government is projected to spend the least on public health in 2040. While in the World Bank income group it is forecasted to have inched up to 36 in 2040 from 39 in 2014, in the world it will have moved up to 143 from 147.